This recipe is gluten-free and dairy-free (can be made vegetarian). 1. For the base, combine all the ingredients, knead for a few minutes, form a ball, roll thinly and place in an oven-proof tray, trim, and bake for 15 minutes at gas mark 6/200°C. 2. For the filling, whisk all the ingredients except the coconut milk for one to two minutes. 3. Heat up the coconut milk to boiling point, take off the heat and slowly pour in the egg mixture, stirring, and then heat again stirring continuously for three to four minutes. 4. Take off the heat, add gelatine (diluted in 50ml of water only) and whisk for two to three minutes (it should start thickening). 5. 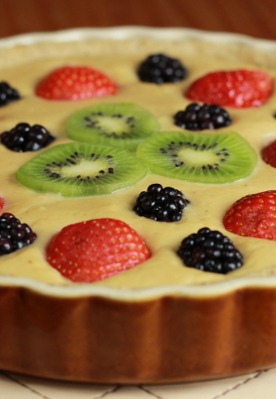 Pour the mixture into the base, decorate with fruit and set in the fridge for two hours. Recipe taken from Easy-to-Follow Wheat, Gluten and Dairy Free Recipes by Eva Detko, PhD. For more information visit www.dr-eva.com.